Remo has 12 years of research experience in water engineering and recently joined the School of Civil Engineering in February 2016. Remo's research projects span over a range of topics such as hydrodynamics in coastal areas and lakes, renewable energy, sediment transport processes, water quality management, seafloor mapping, pipeline surveys etc. Remo started his professional career as a Research Associate at the Franzius-Institute for Hydraulic, Waterways and Coastal Engineering at Hannover University, Germany, where he investigated flood risk and management in tidally influenced estuaries with numerical models. Remo did his PhD on the hydrodynamics of oceanic gravity and turbidity currents under the influence of Coriolis forces in the Earth Sciences Department, University of Toronto, Canada. Remo continued hos work in Canada as a Postdoctoral Fellow in the Department of Physical and Environmental Sciences at the University of Toronto where he focused on turbulence in coastal boundary layers and sediment transport processes in density currents. 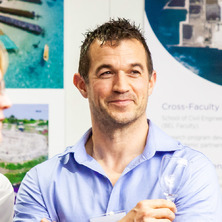 Before joining UQ Remo was working as a Lecturer and Postdoctoral Fellow at the Australian Maritime College (AMC) at the University of Tasmania where he worked on projects in Tasmanian coastal waters (renewable energy, analysis of tidal currents, pipeline surveys) and limnological processes (Lake Ohau, New Zealand). A career highlight was a research trip with a team of sea-ice experts funded by NZARI to Antarctica (Cape Evans, McMurdo Sound) to analyze characteristics of the sea-ice ocean boundary layer using an autonomous underwater vehicle (UBC Gavia AUV). In addition, Remo also worked as a Coastal Engineer at the Federal Administration for Waterways and Shipping in Hamburg, Germany, to improve seaway conditions and sediment relocation strategies for Europe’s second largest port in Hamburg. Hildebrandt, Arndt and Cossu, Remo (2018). Misalignment and lag time of wind and wave occurrence based on 10 years measurements in the North Sea near the German coast. In: Proceedings of 36th Conference on Coastal Engineering. Conference on Coastal Engineering, Baltimore, Maryland, (). 30 July - 3 August 2018. Ferguson, Tom Mitchell, Penesis, Irene, Frost, Rowan, Sartipi, Keyvan, Kemp, Nathan, Nader, Jean-Roch and Cossu, Remo (2017). Development of the Tamar River tidal test facility. In: Proceedings of the 12th European Wave and Tidal Energy Conference. European Wave and Tidal Energy Conference, Cork, Ireland, (). 27 August - 1 September 2017. Power, Hannah E., Cossu, Remo, Callaghan, David P., Nielsen, Jesper, Hughes, Michael G. and Nielsen, Peter (2017). Lagoon stratification in Manihiki Atoll, Cook Islands. In: Coasts & Ports 2017 Conference. Australasian Coasts & Ports Conference, Auckland, New Zealand, (886-892). 21-23 June 2017. Cossu, R., Macfarlane, G., Abbassi, R. and Carvalho, A. (2017). Physical modelling of mixing processes from ballast water discharge in ports. In: Coasts & Ports 2017 Conference. Australasian Coasts & Ports Conference, Auckland, New Zealand, (). 21-23 June 2017. Green, Sam, Cossu, Remo, Penesis, Irene and Nader, Jean-Roch (2017). Tidal Energy: A Promising Future Resource for Tasmania. In: Proceedings of the 3rd Wave & Tidal Energy Conference. Asian Wave and Tidal Energy Conference, Singapore, (). 24-28 October 2016. Beecroft, Ryan, Cossu, Remo, Forrest, Alexander, Hawes, Ian and Lemckert, Charles (2016). Observations and characteristics of the Ice-Ocean Boundary Layer in McMurdo Sound, Antarctica. In: 23rd IAHR International Symposium on Ice. IAHR International Symposium on Ice, Ann Arbour, MI, United States, (). 31 May - 3 June 2016. S. A. T. Randeni, P., Forrest, A. L., Cossu, R., Leong, Z. Q. and Ranmuthugala, D. (2015). Estimating flow velocities of the water column using the motion response of an autonomous underwater vehicle (AUV). In: OCEANS 2015 - MTS/IEEE Washington. Oceans'15 MTS/IEEE Washington, Washington DC, United States, (). 19-22 October 2015. Cossu, Remo (2012). The influence of coriolis forces on flow structures of channelized large-scale turbidity currents and their depositional patterns PhD Thesis, Department of Geology, University of Toronto.